Dr. Stuart Sims is Professor of Music and Coordinator of Instrumental Studies at California State University Stanislaus, where he conducts the Wind Ensemble, teaches courses including conducting and music literature, and manages the instrumental area of the Department of Music. Widely recognized for his work in the standard repertoire, Sims is also active in the commission and performance of new music of all kinds, and performances of his ensembles have won praise throughout the country from composers whose work he has premiered or championed. In demand as a clinician, Sims has served as conductor, speaker, and panelist at many national and state musical events, including frequent appearances as guest conductor for regional honor bands and orchestras, and multiple appearances at the California Band Directors Association annual conferences and CMEA conferences. Keenly interested in expanding the boundaries of concert music presentations, Sims is active in other realms, serving as Creative Advisor for both Townsend Opera in Modesto and Fresno Grand Opera in Fresno, where he originated, plans, and stages performance events in their ongoing Opera Remix series. He is also the founder of Loose Filter Media, whose website features a podcast, audio and video recordings, and cultural commentary, found online at www.loosefilter.com. 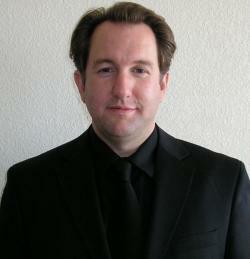 Having studied primarily with H. Robert Reynolds and Gary W. Hill, Sims holds a Doctor of Musical Arts degree in conducting from Arizona State University, a Master of Music degree in conducting from the University of Michigan, and a Bachelor of Music Education degree from the University of Louisiana, Lafayette.